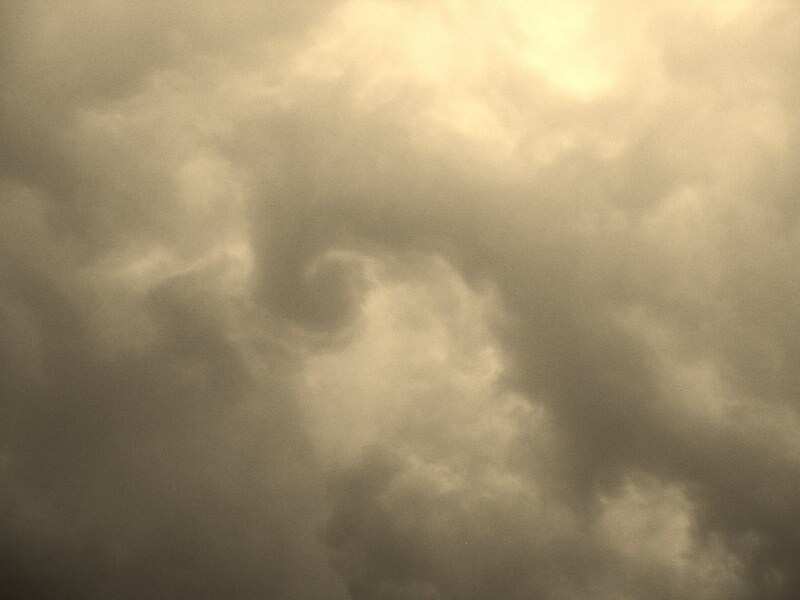 My grandma said dark clouds hold wind. Some of those clouds blew in from the west. Everything got real still. The air held its breath. Birds found a place to settle in trees, held fast, quieted. Crickets and frogs stopped singing and listened instead. The air shifted to cool and heavy. Wind picked up from the southwest, and the sky turned greenish–gray. Eerie, that’s what I remember about the afternoon. It was eerily quiet just before the wind really picked up. I opened the front door and looked toward the Blue Ridge Mountains. Black clouds moved east, toward the house. Usually, clouds close in slowly, gradually inching east over the mountains and through the sky, covering the clear and filling the empty space. They form a line and don’t cross the treetops until all of them are together in formation, a unified front. This time, they rolled in faster and with a force. It was like they were in a hurry to create battle and needed to sneak up on everyone. “Watch out for those dark clouds,” I heard my Grandma say. “Pay attention. If they start to reach for the ground with little fingers, get down low, cover your head,” she warned. I gathered the children. Our basement is a hole under the house, more like a root cellar than a family room. The door faces our vegetable garden. There’s one tiny, dingy window that puts the yard at eye level. The boys wrestled our scratching, meowing ball of fur and claws, and held him tight as we ran through the downpour. We pushed the door open and entered the musty, damp, cold space. A grave came to mind. When my life is in turmoil, I dream of tornadoes. I can’t find my children or get to the basement in time. Just as my last fingertip grip is pulled away by the wind, I wake to a fast heartbeat in my ears. I’d done everything right, gotten us all down low and the drum of my heart still beat loudly in my ears. The boys jumped up and down, squealing with excitement, opening the door to peek out. “Close that door,” I yelled. The door slammed shut and the children used their sleeves to wipe the dirt off the window. We had our backs to the weather outside. The storm was swirling toward us from the west, and the basement faces east. With an increase in the wind, hail arrived. It hit the ground and bounced, nickel size pieces of ice falling from the sky, bright white in the green grass of spring. “It looks like popcorn,” one of the boys said. The sky turned late-evening dark and I kept waiting for the sound of a freight train. We didn’t hear it, but the rain fell in curtains across the yard. We couldn’t see the clothesline. Then, as suddenly as it came, the clouds lifted and the sky lightened. The boys ran out and began throwing pieces of hail at each other, ducking and laughing, splashing barefoot through the puddles in the yard. I took a deep breath, cradling the cat as I stepped out of the basement, and lifted my eyes to the sky in search of a rainbow. It’s Spring now, but with temperatures dipping into the thirties and forties at night, it’s still cold enough to use the wood burning boiler furnace. The stove sits in the backyard, looking like a small shed. Once a day Bruce fills it with large pieces of oak and locust. The wood is stacked on a trailer pulled up close to make hefting easier. Not having to sweat splitting the lengths into smaller pieces makes them heavier to lift. The Wren sits on the edge of the blue tarp covering the trailer. She stands her ground even as Bruce walks within two feet of her on the way to the furnace. She bobs up and down on stick legs, chirping her disdain at him. He ignores her and uncovers the day’s allotment of fuel. Now she’s in distress, flitting from the trailer to the clothesline, to the garden fence post, all the time rattling off a litany of curses at my husband. He’s oblivious, and hard of hearing it seems. “Hear who?” he questions, looking around for a neighbor or visitor. “The Wren,” I exclaim, pointing at the little brown bird, having a conniption in the Lilac bush now. “I didn’t see her,” he says. He closes the door of the stove having not put one stick in it. He walks over to the far corner of the garden and stands watching until the Wren flits back to the woodpile and ducks under the blue tarp. I pull the window down and watch Bruce as he leaves the backyard only to return a few minutes later with a wheelbarrow full of wood. He makes a wide berth around the trailer and parks the wood by the stove. He makes three trips to fill it. I walk out the door to feed the chickens, and Bruce turns to me shaking his head. I can’t help but giggle. “You don’t have to worry about the traffic. I’ll drive you there, you stay the weekend, and I drive you back. We take the tour, spend all the time we want, you take all the photos your memory card holds, no stress.” My friend Ann stood, palms up, shoulders in a shrug. “Peak is Tuesday, Saturday’s close enough. Come on,” she said. The invitation was too sweet to resist. 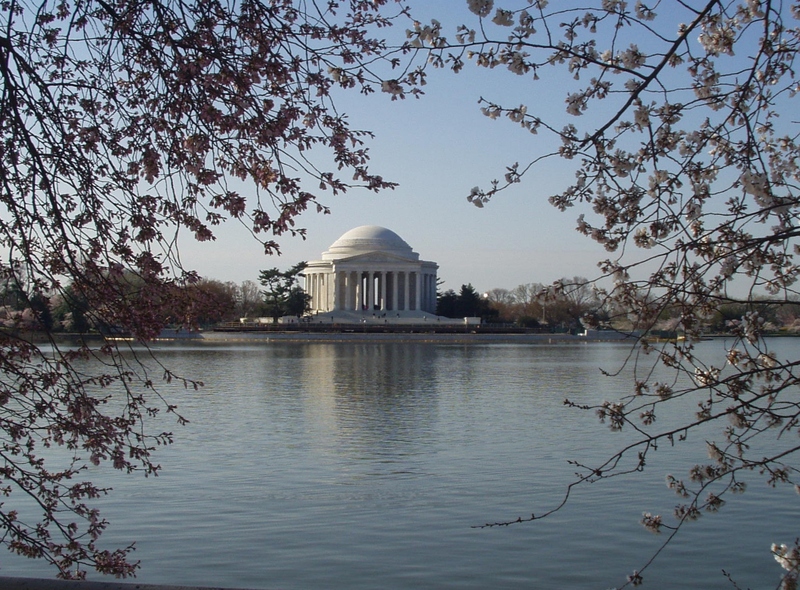 I’d always wanted to go to Washington, DC during the Cherry Blossom Festival, but was too frightened by the crowds and traffic. I’m a right lane, one speed all the way kind of girl. Slow speed. I’m from the country; and even though Washington is two hours away, the concrete lanes of Rt 66 and the Beltway around the District of Columbia shoot cars at rapid fire speed out of some type-A personality machine. Ann lives in Fairfax, just outside of the city, and was offering me all the perks and none of the hassle. We pulled out of Charlottesville at three-thirty on Friday afternoon and arrived at her house a little after six. Over dinner, we discussed our next day’s agenda. I was so excited about riding the Metro, an underground monorail, and taking in the sights, I agreed to follow her anywhere, to any exhibit she suggested. I just wanted to experience the three dimensional reality of the pink and white flowering tree postcards I’d seen. 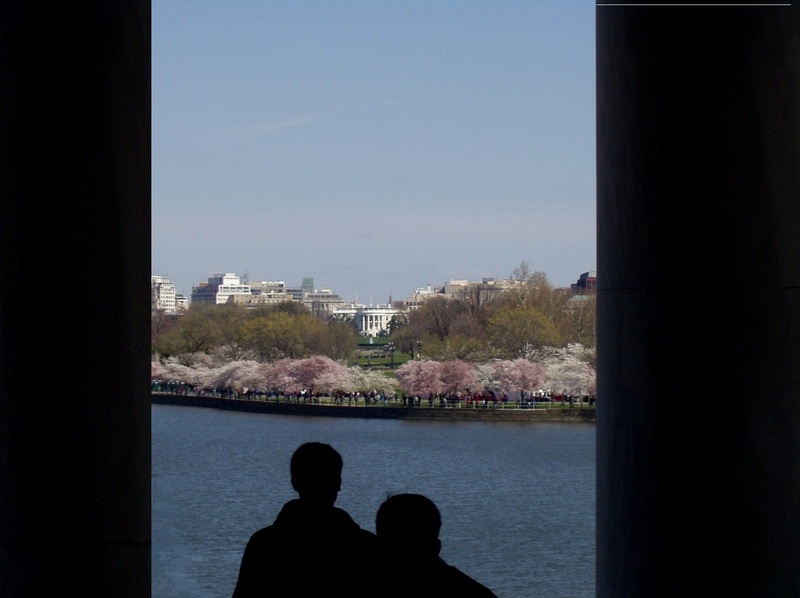 “The Nation’s Capital at Cherry Blossom Time,” they read. “Wish You Were Here.” Now I was. The sun was rising as we pulled into the Metro station and boarded the train. Few people were awake this early on a forty-degree Saturday morning. We enjoyed a clear sky and a brisk wind. I pulled my striped hat out of my coat pocket and pulled it over my ears. 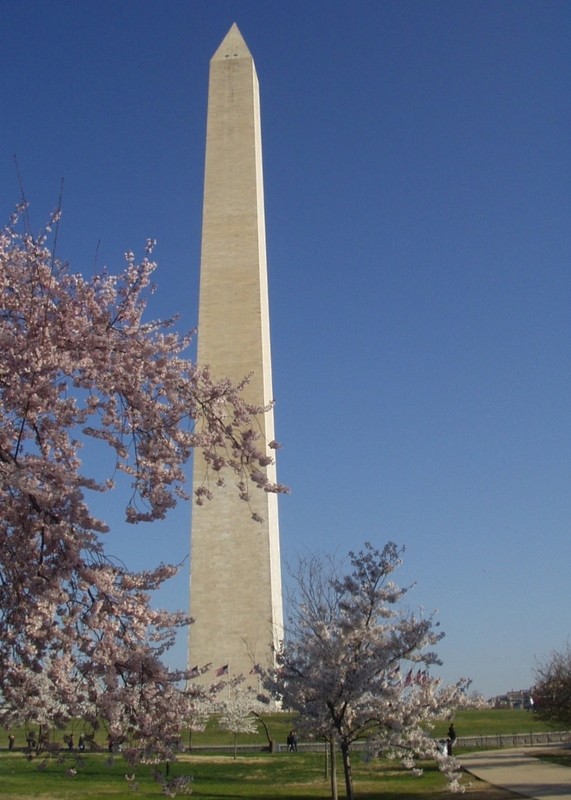 The Metro spit us out onto the Washington Mall, the Capital was to our right and the Washington Monument rose tall and brilliant white to our left. The only other people we encountered at that hour were runners blowing white puffs into the air. We spent twelve hours downtown, and walked six miles. Our trek took us to the World War II , Jefferson, and Roosevelt Memorials, The White House, Capital, American Indian Museum, Moongaze and Sculpture Gardens, The original castle-like Smithsonian Building, and we strolled the two miles around the Tidal Basin surrounded by a profusion of Cherry Blossoms reflecting their pinkness in the water. I hugged her. “Thank you for helping a country girl bolster her courage. This trip really was a dream come true,” I said. “Check your email when you get home,” she said with a wink. When I clicked on my inbox, there was a message from Ann with the subject: M. Dawn goes to Washington. 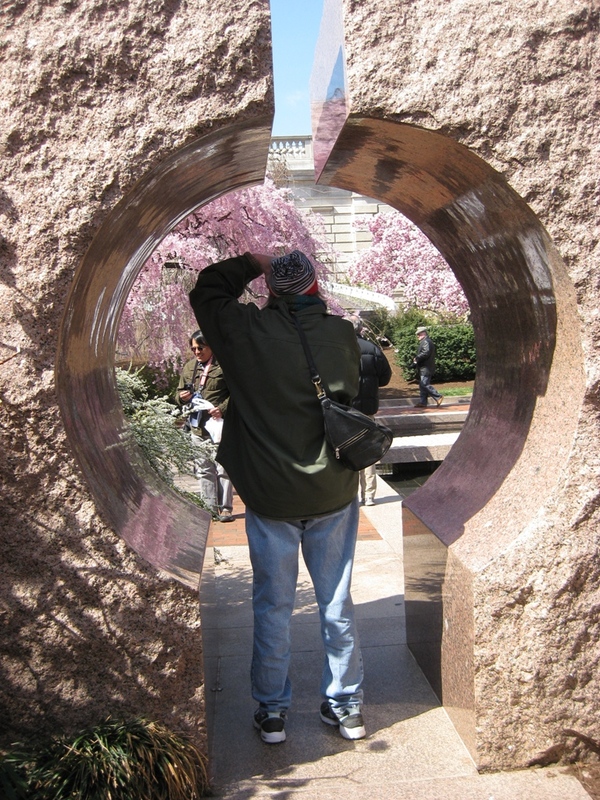 I opened it and found a collection of Ann’s work: Photos of me in my quest for the perfect cherry blossom shot. I saw online that the Three Rivers Quilt Show is in Pennsylvania this coming weekend. It’s at the Circuit Center on Hot Metal Street in Pittsburgh. The drive is a little over six hours. I’ve got the CRV now and Ann has the weekend free. Wonder if she’s up for the trip. I hear the Pennsylvania Turnpike isn’t quite as bad to travel as I used to think.